Here’s a photo of an A. Carbone & Co. delivery van taken at Denver’s Civic Center Park. Photo is originally from Denver’s Roach Photos, closed last year. 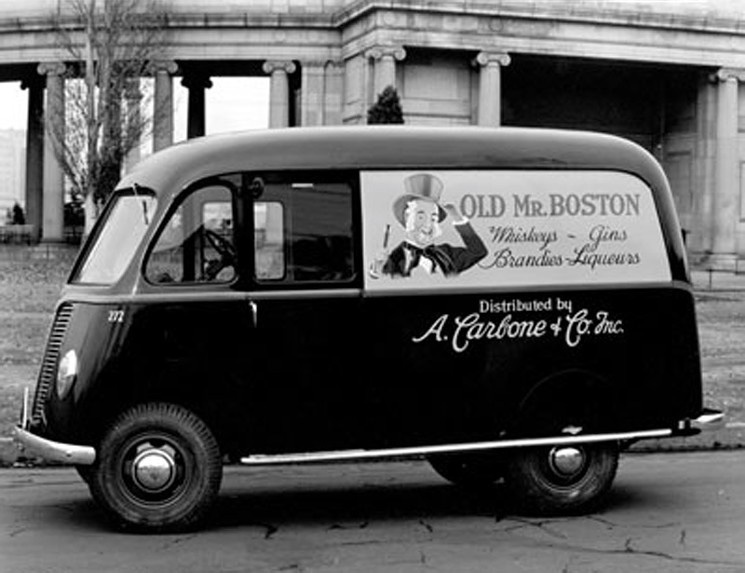 A Carbone & Co. delivery van, circa 1940s. The van is likely a mid-1940s International Harvester. A copy of this photo can be seen on a wall of Gaetano’s Italian-style restaurant on 38th Ave in Denver. These bottles were generously donated by Dale Sawin. Dale posted a photo of one of the bottles on Facebook, responding to a photo of R. Carbone’s Restaurant (now Lechuga’s,) thinking the bottle was from the R. Carbone Family. I offered to purchase the bottle, Dale said he’d donate the bottle if I would take a photo with him, that photo is below this pic. Dale and his two great kids met us at Lechuga’s. Dale Sawin and William Carbone at Lechuga’s March 8, 2019, holding the bottles Dale generously donated. Here’s another photo of the bottles. This is the half-gallon jug. 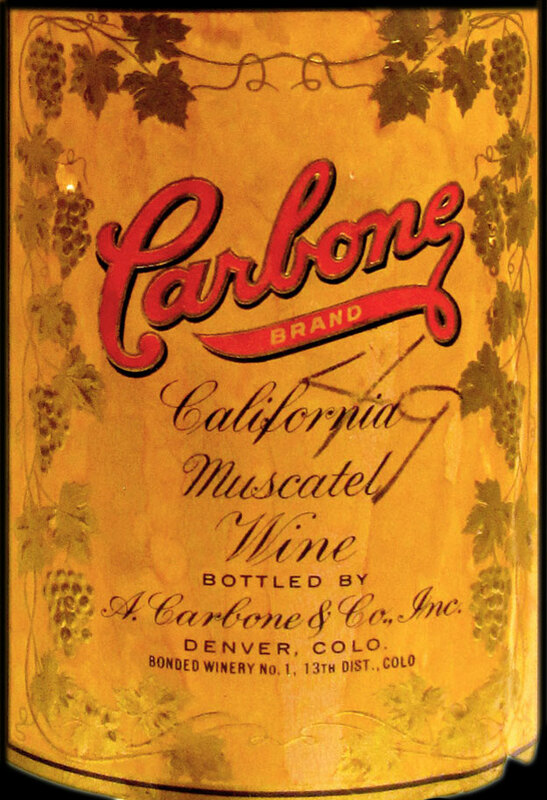 ’50s era Carbone Wine Quart Bottle with *Muscatel label, screw-cap, foil capsule, and tax stamp, generously donated by the lovely Bain Family of Lakewood, Colorado. ’50s era Carbone Wine Quart Bottle’s 6-cent Revenue Liquor Stamp and foil capsule. The bottle was donated by the Bain Family of Lakewood, Colorado. Although we can’t be certain of the date of the stamp, we know that Colorado Secretary of State, Geo. J. Baker was in office 1949-1953 so it’s most probably from ’49 through ’53. Thank you Bain Family from Lakewood, CO. FYI Mr. Bain mentioned – and I hope I get this right – that his grandfather was in charge of moving the trains around The Denargo Market which was the location of A Carbone & Co Inc.
Greg and Krissy found this 24-oz. 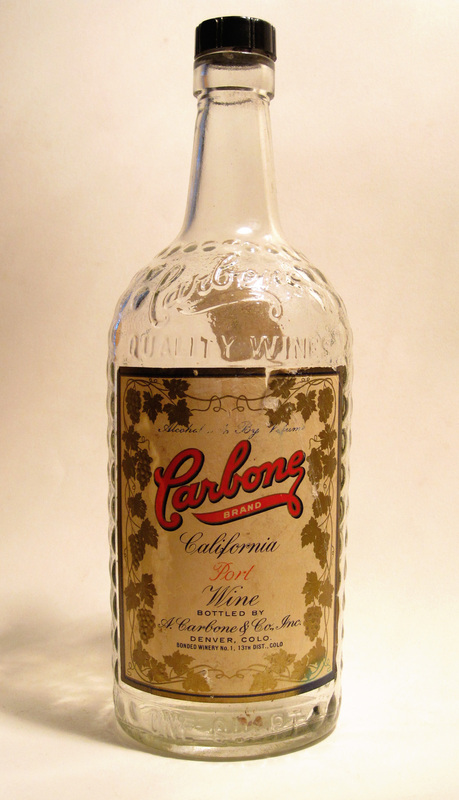 Carbone Wine Riesling wine bottle, dated 1934, online. It’s our first 24-oz. bottle shape. I also think it’s the first Riesling bottle. Here’s a Carbone Wine cooler/dispenser, circa 1950s. I’m going to say that the dispenser came from the basement bar of the house on 17th and Hudson, and before that, from the Tasting Room of the Carbone Warehouse on Wazee. And … that the very cool, little, L-shaped bar with it’s four backless, red-Vinyl stools (sorry no photo) also came from the tasting room at the Carbone warehouse on Wazee. There’s a partition in the center of the ceramic container for the beverage and a three or four-inch space around the partition for ice. One of the spigots (center white metal?) delivers the beverage, the other is for draining ice-water. I’m guessing a wine punch from the Carbone Recipe Book was a favorite. I’ll post a photo of the recipe book, and the recipes as soon as possible. Thanks Krissy for the photo, the dispenser is now in her collection. Here are more photos: a Carbone Wine Matchbook and a Carbone California Burgundy Wine Bottle – both circa 1950s, probably. The Carbones are searching for Carbone Wine bottles so that we may pass on little pieces of our heritage to our children. We have found many bottles in unlikely places. This bottle (below) was found and donated to the family by firefighter Mike Thayer. Mike and his fuels crew of the Jefferson County Sheriff’s Office were doing fire mitigation when they stumbled upon the bottle buried in the dirt near an old cabin. We are grateful to Mike for his efforts in tracing it to this blog and for his generous donation. We and our children thank you! Thanks to master gardener Dawn Anderson for finding this bottle in a stream running through Botanic Gardens at Chatfield in Jefferson County. She almost recycled it, then saw how special it was and decided to google our name! Thanks Dawn for contacting us. If you should happen upon a bottle – very distinctive with the name Carbone Wines embossed in the glass – we would gratefully appreciate your contacting us. Send mail to addresses on ABOUT page, please. Krissy’s husband, Greg Nauretz, bought this bottle online several months ago. 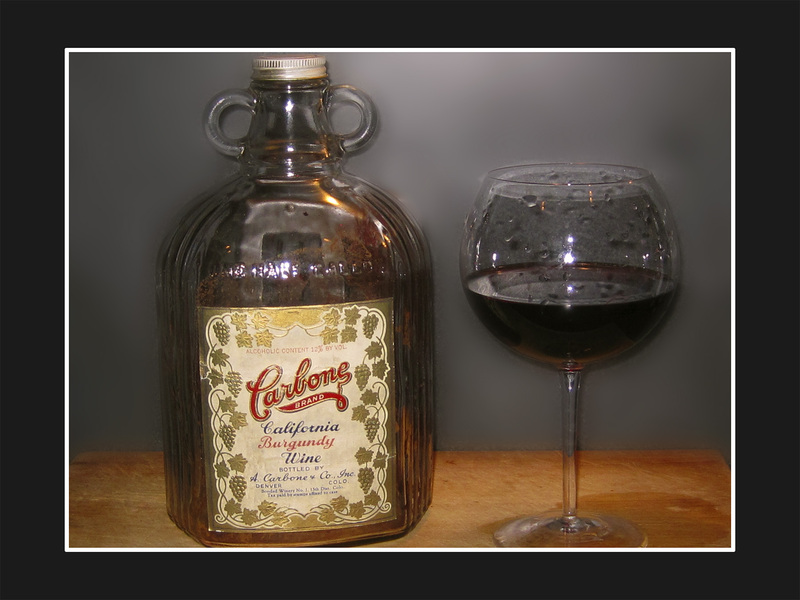 He got the bottle at the same time he acquired the California White Port Wine Bottle, bottled by A Carbone & Co. Inc. for Davis Brothers Drug Co. under their DB Hillside Brand label (below.) The bottles were in Cheyenne, Wyoming. The Wyoming reference is relevant since – according to Claudia’s research/story – grandfather Carbone first settled in Wyoming. In fact, the bottle is most probably *pre-prohibition. Thanks, Greg for bringing this to our attention. 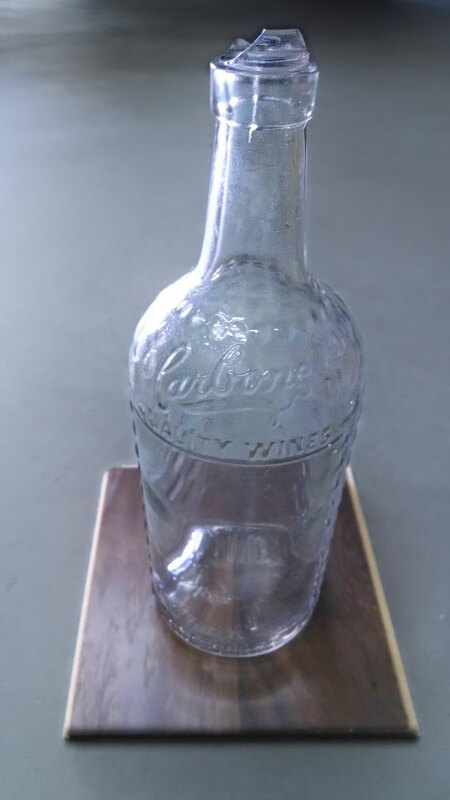 ’50s era Carbone Wine Quart Bottle with Muscatel label, screw-cap and foil capsule generously donated by the lovely Bain Family of Lakewood, Colorado. 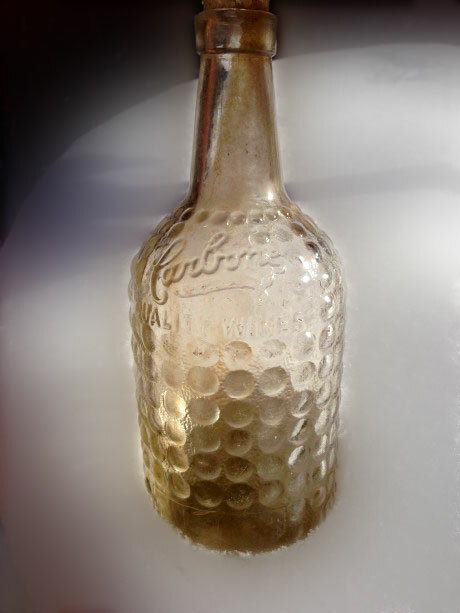 California White Port Wine Bottle, bottled by A Carbone & Co. Inc. for Davis Brothers Drug Co. under their DB Hillside Brand label, photo enhanced. 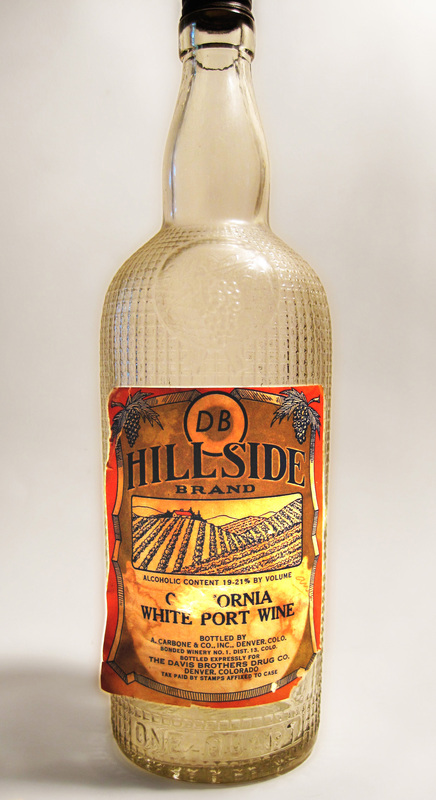 This very unusual quart-bottle of California White Port Wine, which was bottled by A Carbone & Co. Inc. for Davis Brothers Drug Co. under The DB Hillside Brand label, is part of Krissy and Greg’s collection, thanks Krissy and Greg. I found an online ad for Davis Brothers Drug Co. from 1916, which was at 1401 Lawrence(?) Denver, Colorado. Spratlen-Anderson Wholesale Grocery Company–Davis Brothers Warehouse – Denver, CO. “The Spratlen Mercantile Warehouse was purchased in 1923 by the Davis Brothers Drug Company. Davis moved to Denver from Rawlings, Wyoming and purchased the firm in 1901. He died tragically in a railroad crash in 1909, but his sons and grandsons went on to build Davis Brothers into a large wholesale drug firm.” Visit the link (above) for more information. Here’s another bottle from Krissy and Greg’s collection: a Carbone Tokay Wine Gallon Jug with a Louie Greenwald Label. Apparently Louie Greenwald’s Liquor Store was in the huge Home Public Market Building at the corner of Fourteenth and California Streets, filling 78,000 square feet of space with 70 vendors. 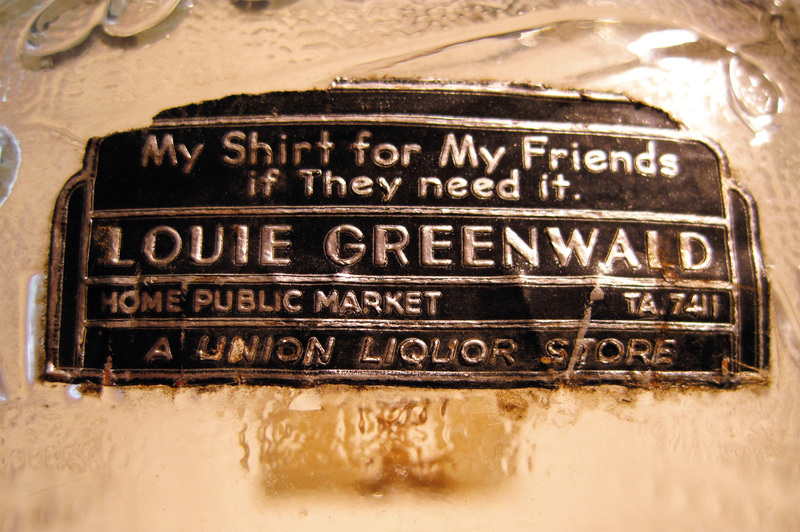 Here are more pics: (Home Public Market in Denver, Colo. circa 1930-1940) Louie Greenwald’s sold this bottle in the Liquor Store. 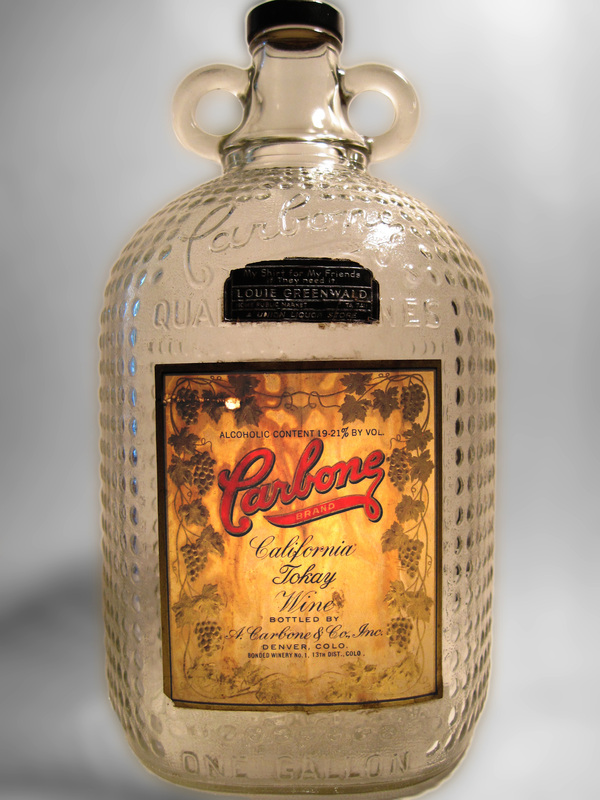 A Carbone & Co’s Carbone Tokay Wine Gallon Jug with the Louie Greenwald Label was bottled at the warehouse/bottling room in Denver. Here’s a close up of the Louie Greenwald Label. “My Shirt for My Friends if they need it,” photo enhanced. 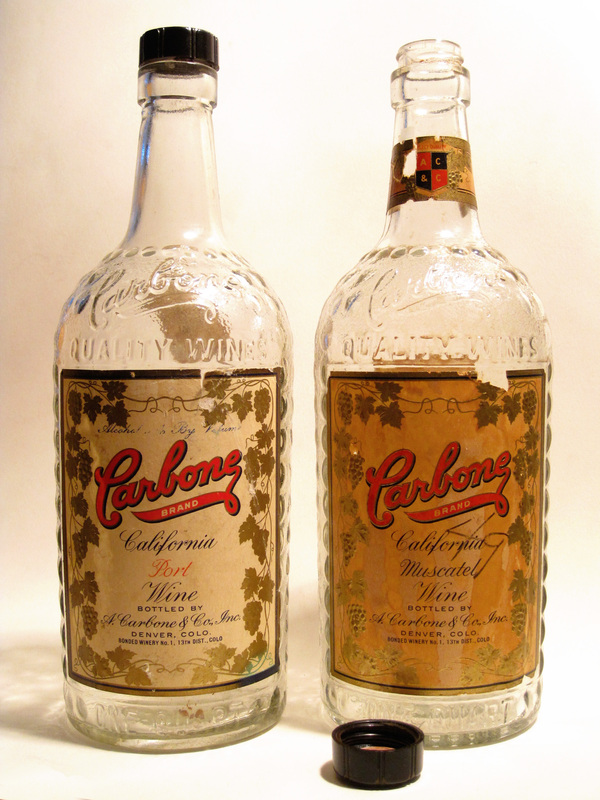 A Carbone & Co. Inc. bottled that wine at the Carbone warehouse bottling-facility, the first in Denver. And last but not least for this series, three Six-Cent Tax Stamps dated Nov. 27, 1940. These 6-cent liquor-stamps were “signed” by the Secretary of State. According to the Jack Daniels Collectors Page, Colorado’s Secretary of State in 1940 was George E. Saunders (1935-1941.) 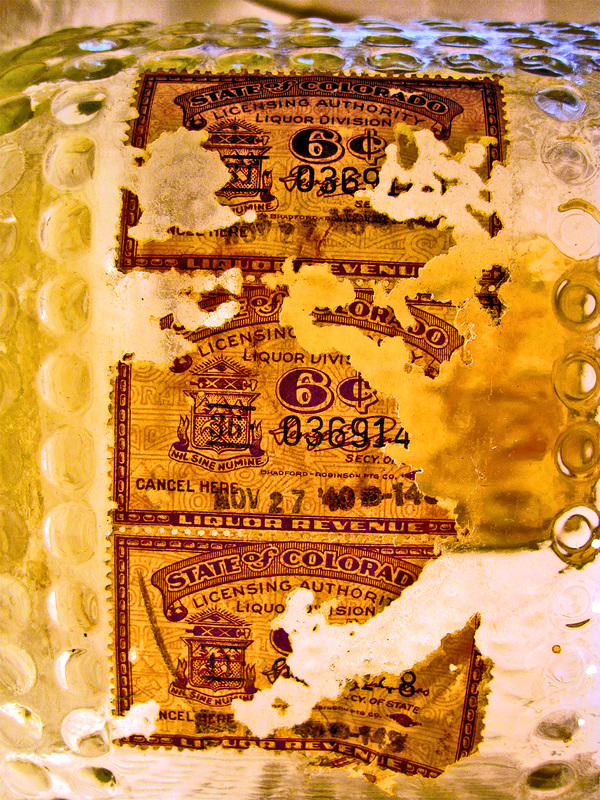 Apparently a one-gallon-jug required 18-cents worth of tax stamps; we have quart bottles with a single six-cent stamp. Wine bottles from the 50s. Note the “49” written in pencil on the Muscatel label (right) referring to the 1950s price. 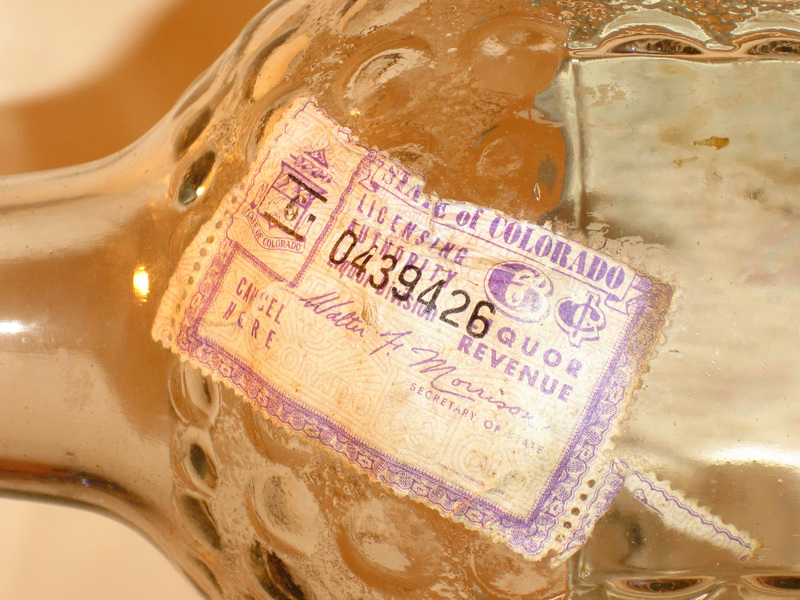 A 6-cent tax stamp is attached to the Port bottle. Carbone Wine Muscatel Label with “49” (1950s price) marked in pencil. These Carbone Wine Bottles are from Paul Weingardt, a collector who generously donated them. 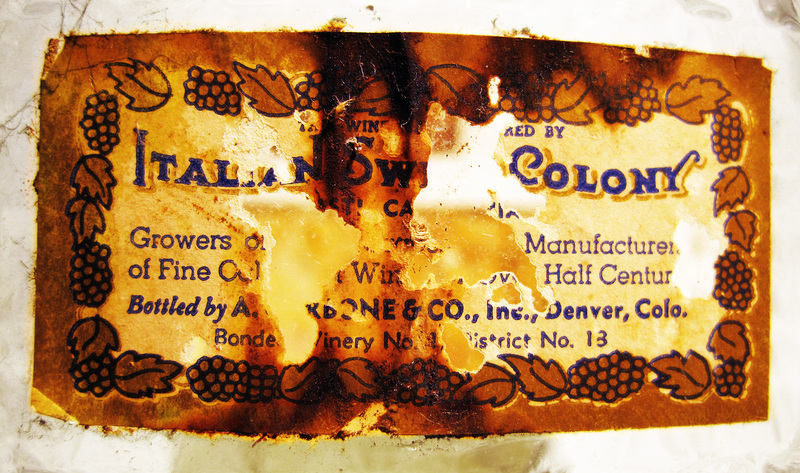 In the 50s A Carbone & Co Inc. was run by three of A Carbone’s sons: John, Arturo and Americo, and two daughters, Caroline and Milly.